The Centre is operated and managed by a group of volunteers, The Friends. 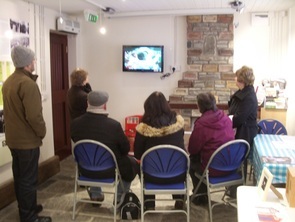 Many of the Friends give up a few hours a month to staff the Centre where they provide information to visitors on the local heritage and on other attractions in the area. Many visitors to the Centre bring their own anecdotes and information about the village which help us to provide more information to following visitors. If you are interested in supporting the work of the Friends why not become a member <membership form> or contact the Membership secretary at membership@clydachheritagecentre.com for more details. A timeline of Clydach from 1794 (the year construction started on the Swansea Canal) to the present day. The Brick chimney – a chimney constructed with bricks from works across South Wales. Coal Dram – a dram typical of those used to bring coal to the canal for transport to Swansea Docks. The last load carried on the canal was coal. Canal Mileposts – markings show the distance travelled along the canal in ¼ mile intervals. The canal was 16 miles long in total. 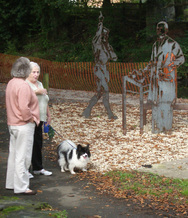 Clydach local interest – books, leaflets, walking routes, DVDs and CDs including oral archives of local characters. Exercise - a map of the orienteering course in Coed Gwilym Park ( a little prize if you get all the answers right); the Sustrans Route 43 cycle track runs beside the Centre, along the canal tow-path. Swansea Canal - DVDs and explanatory leaflets. 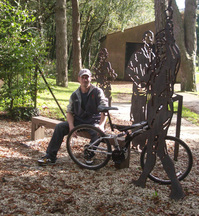 Portrait Bench – as part of the development of the Sustrans Cycle Route 43, a bench has been erected between the canal and the Centre with three sheet steel portraits. The three characters represented are Lillian Smith (a local midwife for many years), Derek Bevan (local lad and international rugby referee, including four World Cups) and Harry Grindell-Matthews (inventor of the Death Ray, whose laboratory was at Tor Clawdd above CraigCefnParc).